BEIJING — Major stock markets and the price of oil turned lower on Monday as investors looked ahead to the Fed's meeting in Jackson Hole, Wyoming, for clues on timing for possible interest rate hikes. KEEPING SCORE: After gains on the open in Europe, France's CAC-40 was down 0.4 percent to 4,384 in midday trading, while Germany's DAX shed 0.7 percent to 10,466. London's FTSE 100 was down 0.6 points at 6,821. Wall Street looked set for modest losses, with futures for the Dow Jones industrial average and Standard & Poor's 500 index down 0.3 percent and 0.2 percent respectively. FED WATCH: Investors are looking ahead to a speech by Fed chair Janet Yellen at an annual summer gathering in Jackson Hole for indications of how policymakers view the outlook for economic growth and interest rates. Analysts expect Yellen to express caution but support the impression the U.S. central bank is on track to raise rates as early as this year. ANALYST'S TAKE: "Recent market price action suggests that nervousness about Fed policy may persist ahead of the Jackson Hole symposium," Citigroup economists said in a report. "With markets pricing almost even odds for another Fed hike this year, and given the retreat in the dollar and the rally in risky and emerging markets, this allows investors to once again ponder their portfolio exposure in the backdrop of subtle shifts in Fed messaging." LOW ENERGY: Energy companies fell as a rally in oil prices last week reversed, with sharp losses on Monday. Benchmark U.S. crude shed $1.32 to $47.20 per barrel in electronic trading on the New York Mercantile Exchange. Brent crude, used to price international oils, tumbled $.158 to $49.30 per barrel in London. CORPORATE DEALS: Shares in Swiss agrochemicals giant Syngenta jumped about 11 percent after a U.S. national security panel cleared its acquisition by China National Chemical Corp. The state-owned company, known as ChemChina, said the $43 billion deal still requires approval from anti-trust regulators. But the security clearance was considered a key hurdle as Syngenta has a lot of business in the U.S. Separately, Pfizer said it is buying the cancer drug company Medivation in a deal valued at about $14 billion. Pfizer will pay $81.50 per Medivation share, a 21 percent premium to the Friday closing price. Medivation Inc.'s stock soared more than 19 percent before the opening bell Monday. ASIA'S DAY: Tokyo's Nikkei 225 gained 0.3 percent to 16,598.19 while the Shanghai Composite Index lost 0.7 percent to 3,084.81. Hong Kong's Hang Seng added 0.3 percent to 22,997.91 and Seoul's Kospi advanced 0.9 percent to 2,017.94. Sydney's S&P-ASX 200 gained 0.4 percent to 5,497.40 and benchmarks in Thailand, New Zealand and the Philippines also rose. 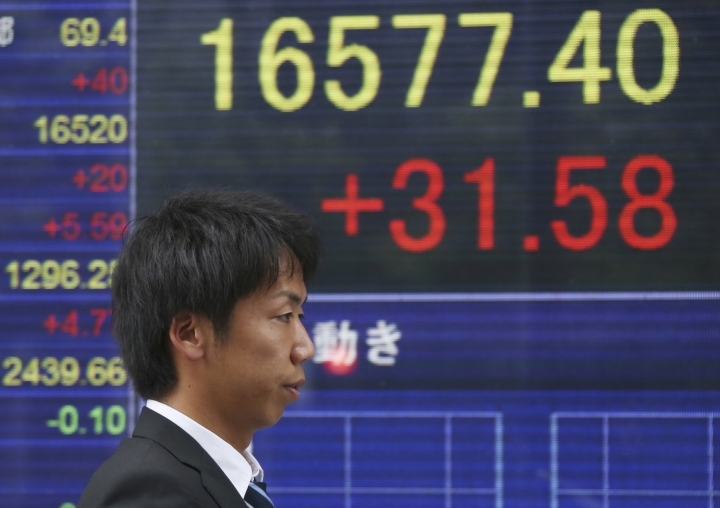 India's Sensex lost 0.1 percent to 28,036.76 and Taiwan also declined. 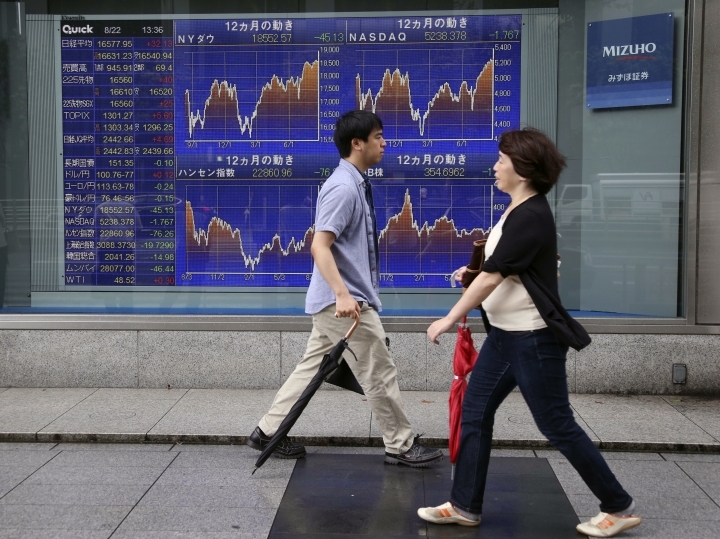 CURRENCY: The dollar gained to 100.55 yen from Friday's 100.22 yen. The euro declined to $1.1304 from $1.1325.